Fresh fruit can be substituted for hash browns for $1.59 where applicable Bagel $0.75 English muffin $0.50 (Can be substituted for toast where applicable). Hash Browns: All of our Hash Browns are seasoned and pan fried with caramelized onions – crispy hash browns available upon request. Gluten Free option available. Modifications to preparation may be required to make this item gluten free. Please tell your server. Some ingredients may be processed in a facility with gluten. Beef tenderloin, fresh ground beef, with a trio of beans topped with sour cream and shredded cheddar cheese. All salads served with our famous, fresh baked, mini-pumpkin muffins. GF-Gluten Free menu is available upon request including homemade gluten free rolls. Six (6) of our BBQ Chicken Jalapenos with diced Ghost Peppers inside, fried crispy and dredged in our homemade Ghost Pepper Hot Sauce. You have Six (6) stuffed peppers, 15 minutes, and 1 beverage. Winners get a spot on our wall and are not charged. If you fail, that will cost you $25. It’s hot. 8 oz grilled Angus burger topped with American cheese served on a toasted Brioche bun with lettuce, tomato, and onion. Served with French fries. *Additional charges may apply for substitutions or additions. Dine-in Only. Side Items: Garlic Mashed Potatoes, Seasoned Rice, Chefs Vegetables, Sautéed Spinach, Seasoned Fries, Sweet Potato Fries, Tater Tots or Fresh Fruit Cup. Dinner bread upon request. 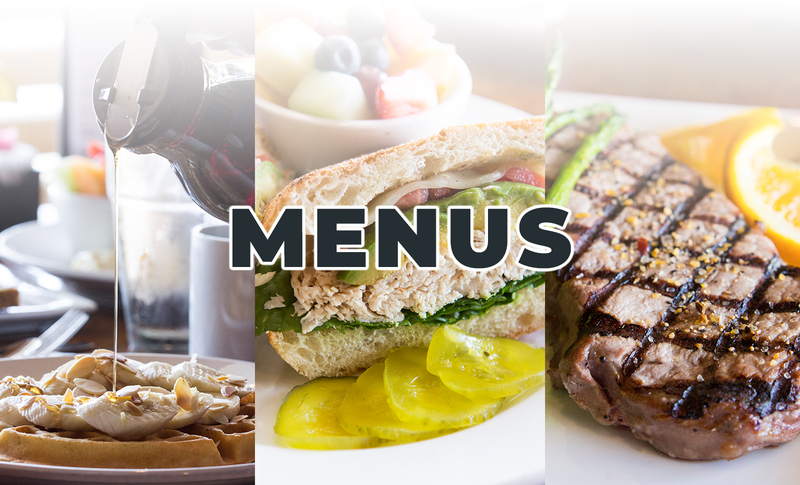 Served with choice of: Garden Salad, Low-Fat Caesar, Creamy Caesar, Cole Slaw, Pasta Salad, Potato Salad, Seasoned Fries, Tater Tots, Soup of the Day, Vegetable Chili, or Beef Chili. All served with our famous, fresh baked, mini-pumpkin muffins. Consuming raw or under-cooked meats, poultry, seafood, shellfish or eggs may increase the risk of foodborne illness. Includes one milk, water or soda. Juice add .99 For kids 12 years of age and younger. Only Available on Sunday, Monday and Tuesday. Can not be used with coupons, other promotions, or discounts. Dine in only! Includes a cup of homemade Soup, Garden Salad, Traditional Caesar or low-fat Caesar Salad. 8 oz center cut pork tenderloin, topped with in-house made apple butter; served with garlic mashed potatoes and chef’s vegetables. Crispy steak cutlet topped with house-made onion gravy; served with garlic mashed potatoes and chef’s vegetables. Grilled chicken, kalamata olives, artichokes, feta cheese and fresh spinach sautéed in a house made marinara sauce; tossed with linguini. Crispy marinated chicken breast encrusted with toasted sesame seeds, panko bread crumbs; topped with our famous plum sauce; served with seasoned rice and chef’s vegetables. Rockfish fillet fried in a yuengling and Old Bay TM beer batter; served with seasoned fries and old bay tartar sauce. Classic Style Meatloaf: roasted and served with a brown-onion gravy Italian Meatloaf: topped with marinara sauce and melted mozzarella cheese Both served with garlic mashed potatoes and chef’s vegetables. Marinated chicken, potatoes, corn, carrots, green beans, peas in a rich creamy gravy topped with a house-made buttermilk biscuit. Grilled Chicken, baby spinach, roasted red peppers, sautéed in a light cream sauce; tossed with linguini. Crispy marinated chicken breast encrusted with parmesan panko bread crumbs, topped with our house made marinara and mozzarella cheese; served atop a bed of linguini noodles in our marinara sauce. Thai spiced marinated grilled chicken breast, spicy slaw and cilantro lime sour cream; served family style with fresh butter lettuce leaves. Topped with your choice of American, provolone, Swiss, cheddar, ghost pepper, gorgonzola or mozzarella, lettuce tomato, and red onion. Add any of the following for no charge; apple wood smoked bacon, fried egg, crispy onion ring, grilled mushrooms, caramelized onions, jalapeños or pineapple. Gluten Free option available. . Modifications to preparation may be required to make this item gluten free. Please tell your server. Some ingredients may be processed in a facility with gluten.